If you have a chance, please make sure to check out the Culinaire Malaysia that takes place every two years! 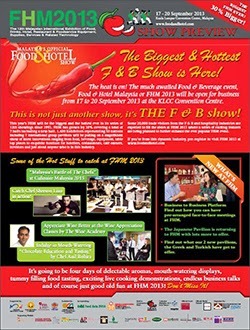 It is the food and hotel event of the year where Malaysia plays host to our local talents and F&B businesses together with international chefs and F&B trade. This year, there are over 8 halls in KLCC with many international business participating. 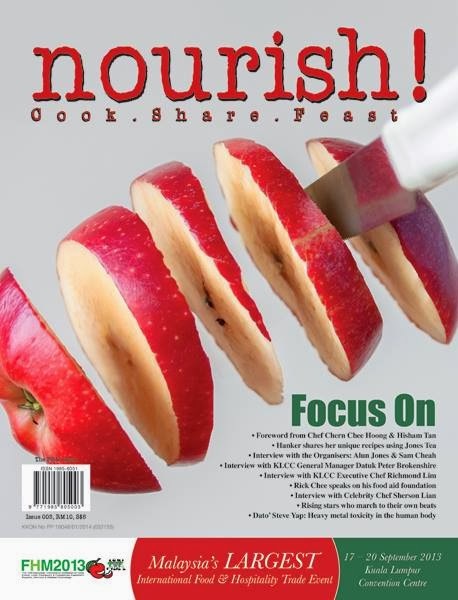 As a contributor in the nourish! magazine, the official magazine for FHM 2013, I managed to catch some actions on the last day of the four-day event. Check out nourish! magazine here. The grand finale of the 11th Culinaire Malaysia climaxes with the announcement of the winners at The Royale Chulan Kuala Lumpur. First held in 1993 in Kuala Lumpur, this internationally acclaimed event is currently endorsed by World Association of Cooks Societies (WACS) and the Ministry of Tourism & Culture. Held alongside Food & Hotel Malaysia (FHM 2013) at the Kuala Lumpur Convention Centre, Culinaire Malaysia drew a gathering of more than 1200 chefs, bartenders, F&B personnel from hotels and restaurants, students of culinary academies and apprentices from the nation as well as 57 local and international teams all the way from Germany, Russia, China, Taiwan, Korea, Singapore, Cambodia, Laos, Thailand and Indonesia who will be vying for 21 individual/team awards. Culinaire Malaysia’s 86 renowned judges from the international culinary and beverage world have made their verdict tonight. 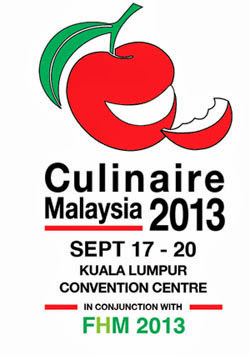 “Culinaire Malaysia is all about reaching your dreams. It is about your passion. Over these four days, we have witnessed 1,288 participants and 57 local and international teams battling to raise the bar with their mouth-watering concoctions and culinary masterpieces. It’s not about competing against each other to win, it’s about getting recognized. The objective of the event has always been to benchmark high level of competency standards in developing world class skills,” said Mr. Samuel Cheah, Organizing Chairman of Culinaire Malaysia in his speech. “Culinaire Malaysia has always been a platform for many of our budding chefs, apprentices and F&B personnel to advance their career paths. With each show, the level is raised higher and I am encouraged each time when I see the impact that Culinaire Malaysia has on its participants. Their achievements in Culinaire Malaysia have led them to obtain higher positions in their profession or even have their own restaurant, consulting or training company,” he adds with encouragement. “In conjunction with Culinaire Malaysia 2013, Malaysia was also proud to host the Asean Hotel & Restaurant Association (AHRA) Conference 2013 which concluded successfully on 19th September with the theme, “The New Age Hospitality - Solutions for the next generation of hoteliers”adds Datuk Mohd Ilyas. The conference featured high profile speakers from the IT industry such as Ms. Tay Shen Li, Head of Internal Communications and Internet Strategies from CIMB Group; Mr. Varinderjit Singh, Vice President of Enterprise Business from Samsung Electronics Malaysia; Mr. Clifford Manifold, Regional Sales Director of Precor Incorporated; Mr. Gregory A. Duffell, President of Creative Advances Technology and Mr. Pearly Lim, 4G/LTE Program Manager from DiGi Telecommunications. “On behalf of the Malaysian Association of Hotels, I am proud to congratulate Mr. Samuel Cheah and his Organizing Committee for their tireless efforts and sleepless nights all for the sake of this mega event. Our appreciation also goes to Chefs Association of Malaysia and the Malaysian F&B Executives Association for joining hands with us in this endeavour to bring Malaysian cuisine to the world stage,” said Datuk Mohd Ilyas Zainol Abidin, President of Malaysian Association of Hotels. “Our congratulations to the Malaysian Association of Hotels, for once again organising the spectacular Culinaire Malaysia. As the venue sponsor, the Centre is honoured to host this event that encourages friendly competition amongst local chefs, inspiring then to further hone their skills to the benefit of the Malaysian hospitality industry,” added Datuk Peter Brokenshire, General Manager of Kuala Lumpur Convention Centre. Many acclaimed chefs from local and international food and hospitality attended the dinner and the prize giving ceremony that night! Our dinner of the night was a modern interpretation of modern Malay cuisine with a Western fusion touch. The four-course dinner with a palate cleanser was an interesting conversation piece, at least on my table. A punchy salad with herbs and sambal sits on top of savory firm custard of prawn meat. Flavors are fresh and spicy with many textures on the dish. I love this modern take on a rustic and robust venison soup flavored with lots of peppery spices! Bits of tender venison and root vegetables are hearty and warming. The additional touch of golden puff pastry is the perfect partner to dip into the spicy broth. Buttery, flaky and savory, the combination is just delicious. Palate cleanser with soursop, fresh as it should be. The stuffed seaweed roll filling resembles otak otak, fish paste with spices while the chicken roulade was filled with crab meat. I prefer the stuffed fish with coconut chili paste for its aromatic flavors. The chicken roulade was a wee bit tough and dry as it was lean but the filling was decent. Flavors are good overall and my only gripe was the chicken. It was quite an experience at the Culinaire Malaysia 2013 and I am looking forward to the next one in 2015. I will make sure to check it out earlier next round as there was just so much to see at the event! Wow! Really stunning dishes at the dinner, unique & creatively spellbinding! Oooo...you're a big shot in the industry, eh? Dunno if we still can get that nourish magazine here - very Chinese community here, never bought a mag for a long long time. I was there but denied entry, they said the event is for food related professionals ! Too bad ! No proper awarding ceremony we have to ask and find we're we could claim our medals.not exciting event some more not all gold medalist invited for the awarding dinner ceremony. My name is Abdul Rahim, I’m looking for an investor who is interested to invest. I'm searching for a reliable and established business man or company that can act as a trustee to the Investment bond of $150 million USD. I'm willing to re-assign the proceed of this Investment bond to you as a loan or to facilitate the term of agreement that we may enter with you. If you are vast in business and would be capable to handle a capital project, please present your details along with your business plan to enable us review and arrange a meeting with you and our Lawyers. Upon the receipt of your positive response, we shall present the agreement binding the transaction for your perusal and signature.